As I’ve mentioned, I recently moved and am living with 4 new girls from all sorts of backgrounds (which makes me so excited for new food ideas) in this huge old vintage house. It’s kind of crazy having 5 people in the house with 5 different schedules because you never see all of them at the same time (and have to repeat your stories 4 separate times) so we decided to attempt to have ‘family dinner night’. This seems overwhelming but I think it will work better than expected because there are two of us that love to cook, one that likes to clean (dishes clean up, score! ), and one that has serious sugar problems (shes got the desert aftermath under control). Anyways, so we attempted this family dinner last night and this was the menu: Sweet potato and black bean enchiladas and avocado fries (+loads of Corona and lime! I also suggest tequila if you are trying to REALLY get to know your new roommates). The enchiladas were a great recipe for a large group (we doubled the recipe for 5 of us but really shouldn’t have because we have loads of leftovers!) and a good group activity since you can have several hands stuffing and rolling the fillings in the tortillas. I first came across fried avocado when I visited Austin two years ago for South By Southwest (AKA the best music festival to exist this side of the Atlantic Ocean). I got them at a small trailer-restaurant with some spicy aoili and I went back this spring to find that they exploded all over Austin. They are now a huge trend with the TexMex cuisine and for good reasons: crispy on the outside with a melt-in-your-mouth center. Also lots of places seem to be serving them inside tacos, but we stuck to fries here for a nice side. 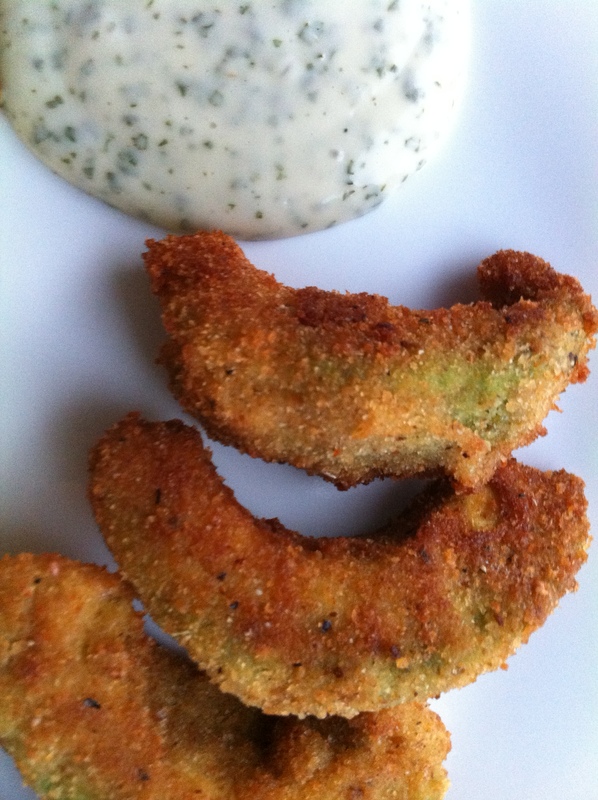 Also, I should warn you that you do have to fry the avocado fries. I realize frying is really a big no no to 90 percent of cooks and if it’s not a no no for you than it’s probably intimidating, but I promise you that it’s really not as messy as you’d think and it won’t take you any longer than cooking something in a skillet. Okay, I’m done with warning and suggestions. Let’s make some yummy grub in the form of Black Bean Sweet Potato Enchiladas! Preheat oven to 350 and find a big casserole dish for the enchiladas. Make the guts of the enchiladas but combining the black beans, garlic, juice of the lime, cumin, cilantro, green chilis, half the cheese, and sweet potatoes in a bowl. Pour half the green chili sauce in the bottom on the dish. Assemble enchilidas by making a straight line of the filling and roll tightly. 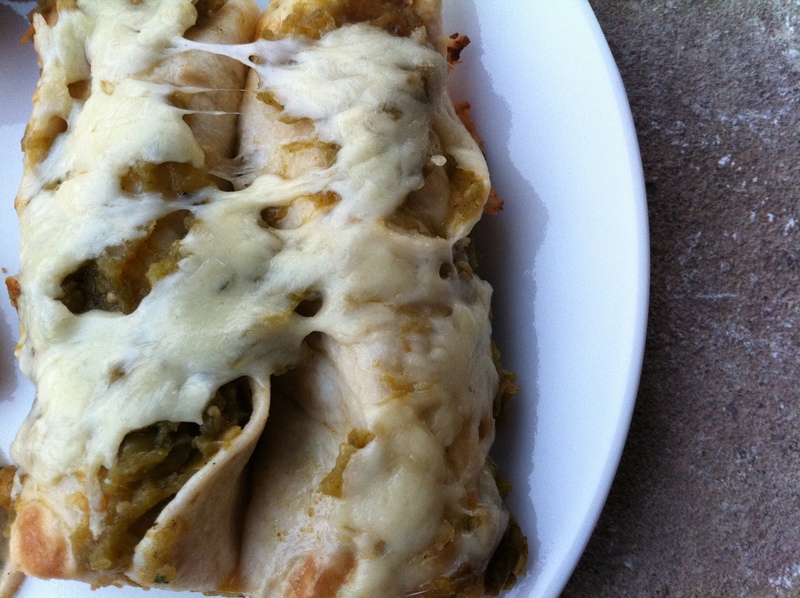 Lay filled enchiladas in dish and top with the rest of the sauce and cheese. Cook for 20 to 25 minutes. Enjoy one or two (warning: consuming more than that in one sitting could cause a food coma. Probably. Maybe. Yeah). Combine the Mayo, cilantro, and lime juice in a food processor (or blender) to blend. Set aside to let the flavors mix while you prepare the rest. First prep a bit: Cut avocado in half and then slice into even strips. Beat the egg and set in a shallow bowl and combine the breadcrumbs, salt, lemon, pepper, and cumin in another shallow bowl. Fill a small skillet with about an inch of oil and let it heat up over medium heat. Dip avocado slices in breadcrumbs, eggs, and back in breadcrumb mixture. Repeat with the rest of the slices. Fry in the skillet for about 2 minutes on each side. Serve with the sauce and eat your heart out. My boyfriend and I found your blog today and made these tonight. 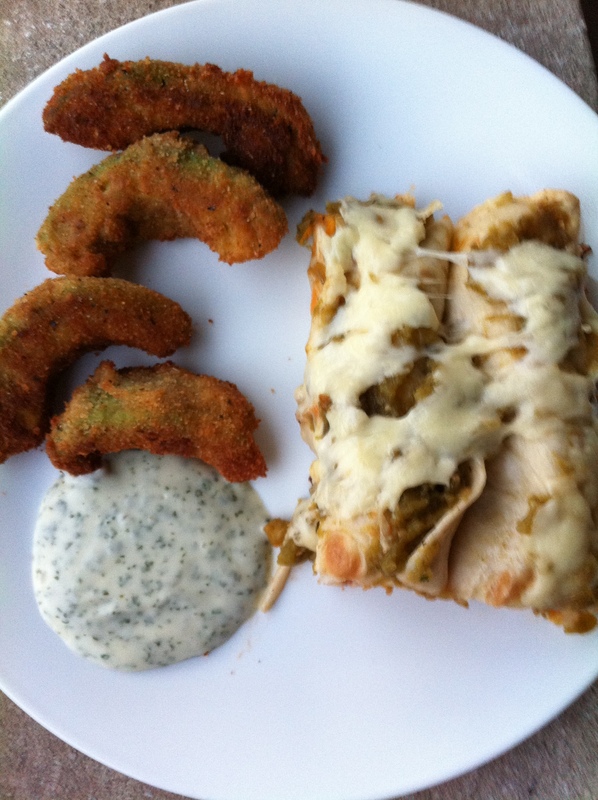 May I just say these enchiladas are amazing! We added some sliced avocado on top before eating them and I think it was a good addition to an already amazing recipe. We also live in Bloomington IN – small world huh? Haha such a small world! Glad you guys enjoyed the recipe!